Perfect Vacation Spot For Your Family To Enjoy The Great Outdoors!! 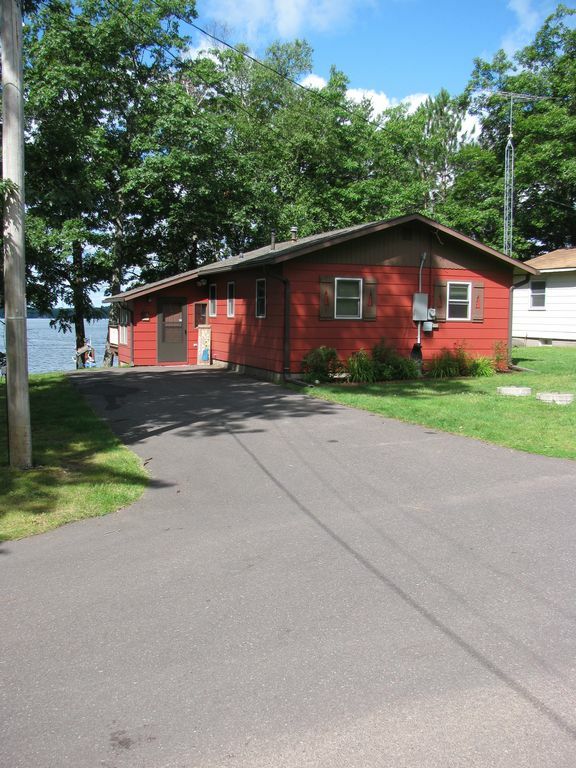 Very clean three bedroom cabin with views of the sunset on Lake La Courte Oreilles.The lake is over 5,000 acres and is spring fed providing crystal clear water. Cabin is overlooking the lake with a large deck. The cabin is newly remodeled with hickory cabinets, hardwood floors and new appliances. Bedroom #1 has queen bed, dresser, Bedroom #2 has 2 twin beds and dresser, Bedroom #3 has queen bed and dresser. Bathroom has tub/shower. Lake bottom is sandy with clear water for great swimming. Six person maximum, no smoking or pets allowed., cable TV, wireless internet, ceiling fans in all rooms, charcoal grill, and fire pit. Low elevation with stairs to lake. Fish cleaning house available to clean the days limit of fish. Private boat landing to launch your boat. Cabin is 15 minutes from Hayward with great shopping and activities for the kids. Please bring your own Kitchen and bath towels. We live in Rochester, Mn and have created many lasting memories with our family at the cabin. We believe a vacation at the lake cannot be topped. We thought that renting out our cabin will allow other family's to create great memories like we were able to. Whatever you are looking for in a vacation at the lake, you will find here, at our Hayward Hideaway. Our cabin is right on the lake. The swimming is excellent. La Courte Oreilles has an abundance of walleye, bass, northern and pan fish. It is also a class A muskie lake. Our cabin is clean, newly remodeled and perfect for your family. We are only 15 minutes from Hayward, WI. The town is super cute with it's candy shop and all. Lots of activities for kids. Gas stove, microwave, refrigerator with ice maker, dining table, Charcoal Grill. Please bring your own kitchen towels. Fire pit with 6 chairs. Patio table with 6 chairs. We booked this cabin for a last minute snowmobile trip. The cabin was exactly what we were looking for. There were snowmobile trails located right on the lake that took us anywhere we wanted to go. Parking was tight with a 3 place trailer. But this was partially due to the amount of snow there. The inside was clean and had everything we needed. Thanks! We went here for a long girls weekend. The kitchen was well stocked with pots/pans. It was a clean cabin with a great sunset view. Easy access to Hayward for supplies. We would definitely book again. Cannot say enough great things about this little piece of paradise on LCO! We had such an amazing experience during our weeklong stay. Before our departure Gena personally called with info regarding the cabin to make our stay easier. She was easy to get a hold of id needed. Ive been visiting LCO for 30 years, and stayed at various places, but this was by far the CLEANEST place we've ever stayed. The cabin was very well cared for, updated and comfortable. Our group of 3 adults and a 4 year old had all the room we needed. The deck was one of our favorite features. The view is amazing any time of day, but especially the sunsets! We also loved hanging out by the fire pit and seeing various wildlife in the evening. Having had to do some work, even on vacation, we appreciated the strong wifi. The water clarity was great and swimming around the dock was great for our little one. Fishing was good too, we caught 2 big largemouths just beyond the dock. It's been almost 2 weeks since we've returned home and every day we say how much we wish we were still there. Can't wait to return. Thanks Bob and Gena for a week of great memories! Great place to stay, we were there in May 2018. It is very clean and decorated very nicely as accurately described. Nice people to work with with great communication. Fabulous lake view and breath taking sunsets. We plan to return there again!!!! Thank you Bob and Gena for a wonderful stay!!! A great, clean, very cute cabin south of Hayward. It had everything to make your trip a great one. We hope to return soon. What a great place to stay, close to everything. Bob and Gena have a real gem in this cabin. Great communicators, very clean and well kept. It fit our family of four perfectly. Close to the snowmobile trails which worked great for us, I can only imagine this place in the summer it has to be perfect then also. Would not hesitate at all to rent this place again! !